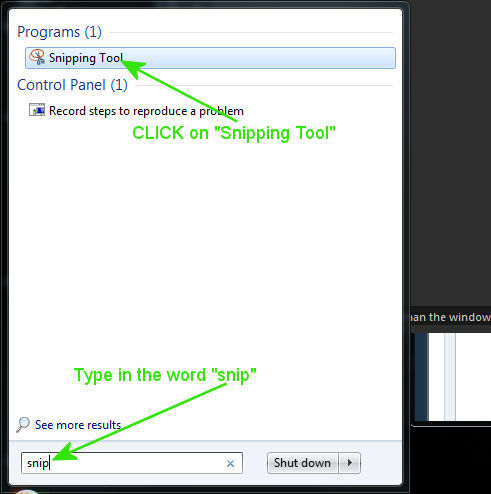 This tutorial is written for use in Windows 7, but any version of Microsoft Windows with the Snipping Tool installed can be used. The process for creating a screen shot is extremely simple. There are several ways to accomplish the above, but the steps I show here are the most direct and easiest way to accomplish the task. 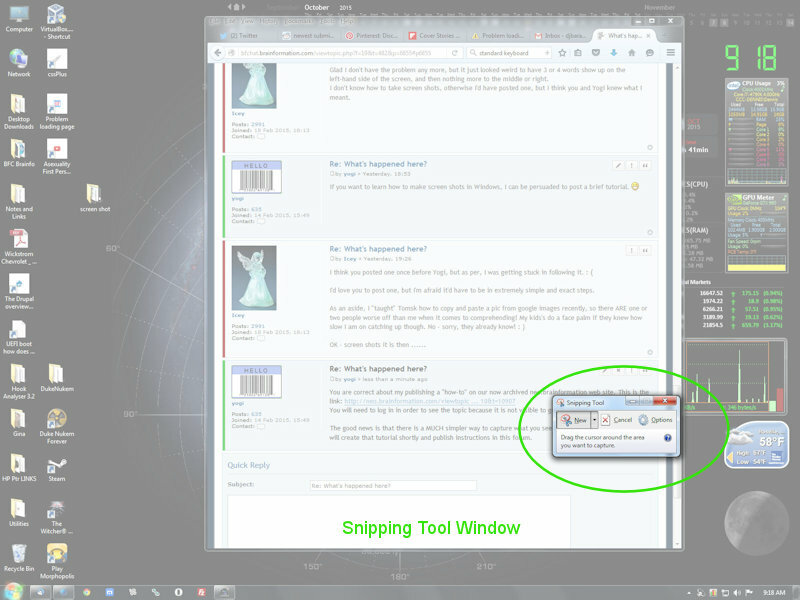 When the Snipping Tool starts up the entire monitor screen will be greyed and a small box with the tool will appear. 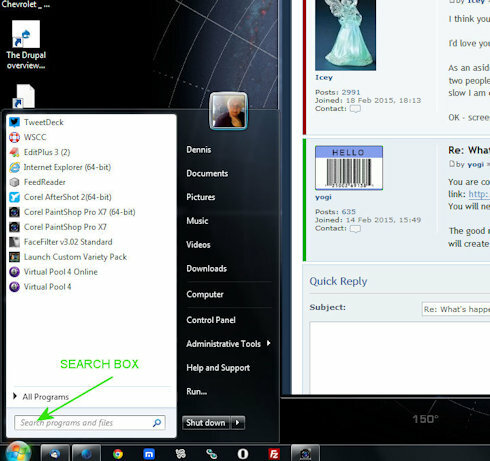 Not shown in the photo is a cross-hair cursor that can be moved across the monitor with the mouse. MOVE the CROSS HAIR to the upper left corner of the image on the monitor you wish to preserve. DRAG the CROSS HAIR to the lower right corner of the image on the monitor you wish to preserve. From here you may edit (to a limited degree) your screen shot or save it as is by using the settings and tools at the top of the window. Some experimentation may be necessary to capture exactly what is intended or to edit the screen shot. Normally the image can be saved without editing, but it may be helpful to review all the possibilities of this tool. The image file formats are quite limited but the three most popular are available: .jpg. .png, and .gif. 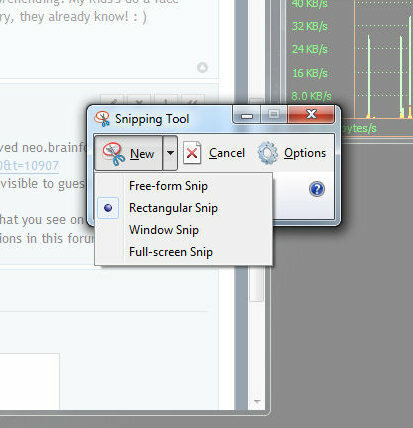 Four (4) types of screen shots may be captured by the Snipping Tool. Select which type you desire from the pull down menu associated with the [New] button. 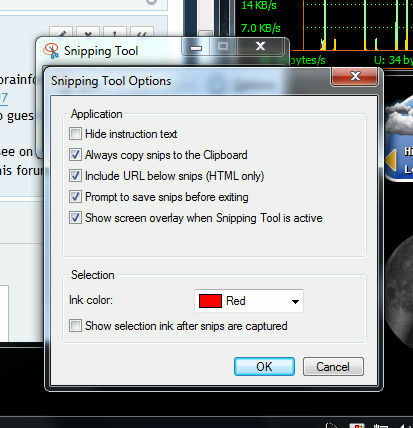 This tutorial demonstrated how to do a "Rectangular Snip" by dragging the cursor from corner to corner. 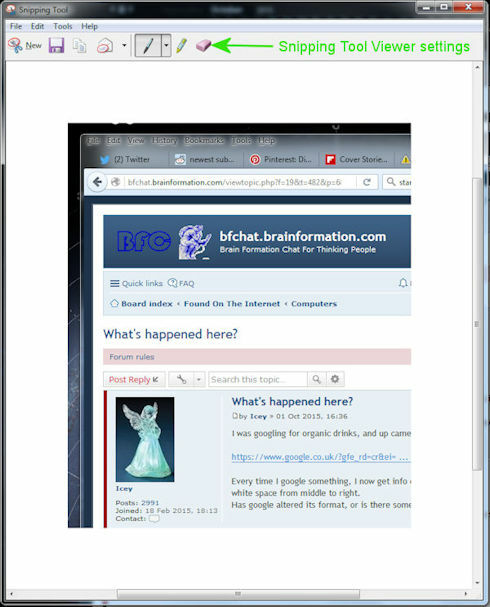 Additionally a single active window may be captured, the entire screen, or a free hand portion of the screen. The Options menu is straight forward and check marks may be applied or removed as desired. Again, some experimentation here will help you set the program to perform to your needs.